Emma Ferguson is a software engineer at Eventbrite, which claims to be the world’s largest self-ticketing platform. 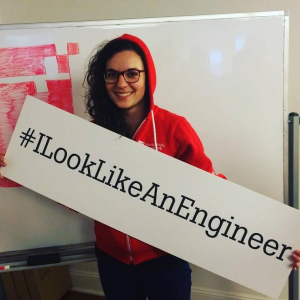 She graduated from Hackbright in March of 2016. 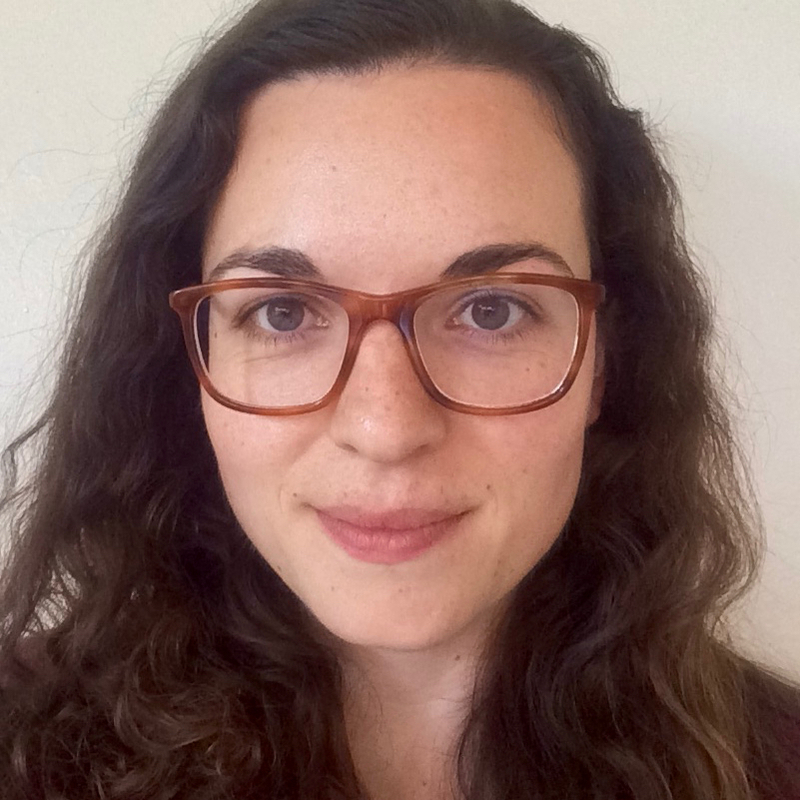 Before Hackbright, she worked as a data analyst for four years. When not coding, Emma skis, bakes, walks shelter dogs, and loves to hang out around museums! 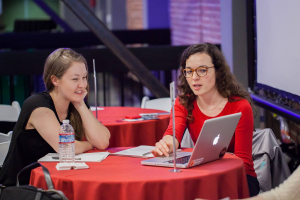 In 2016, Emma volunteered as a Hackbright mentor. 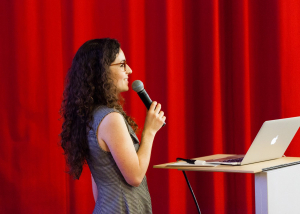 This year, she serves as one of Hackbright’s first ever alumnae Ambassadors. I didn’t know I wanted to be a software engineer until I was well into another career. I had been working as a data analyst at a startup for nearly two years. That mostly meant working in Excel all day, every day. There were maybe 40 people, and I was the only analyst, so I was doing work for just about everyone else — everything from business and financial reporting to customer use analysis for our products. My data scientist coworkers sometimes pointed out that if I knew Python, I could automate my work. When I began my second year, I realized just how much duplicate work I was doing, and decided to take their advice. I went into this weeklong Python course, but found myself in over my head. I jumped back, and took Codecademy’s online Python course. It was a good course, but I already had 40 to 60 hours a week of work to do before even looking at it. So I looked at different options. It seemed the evening classes I found wouldn’t teach me much I couldn’t learn on my own. Yet as I taught myself more about Python, the data scientists I worked with told me I was over-engineering my projects, coding up more automation and features than I needed to. But’s it’s fun! I protested. They responded: Maybe you should just be an engineer. To do that, I needed a more formal education — not years of college, but months of full-time focused training. Hackbright taught Python, and had a good reputation for alumnae among my friends in tech. I did not pick Hackbright because it was all women. In fact, didn’t see the benefit of that until the pending students in my cohort began emailing one another to get to know each other before classes began. It was intimidating at first — so many of my cohort were, like, “I have a masters in bioengineering, after completing my undergrad in theoretical math.” I was a theater major! But then we all met in person at the start of the semester. Normally, when I’m in a room with lots of people I don’t know, I get nervous. But for once, it was so easy! We were all women who wanted to switch careers into software engineering, so we had a lot of the same dreams and the same worries. We talked about how we were all a bit nervous to be there. It felt great. The alumnae network wasn’t just a selling point. It was obvious from day one that everyone was willing to support each other and teach each other as we learned. Women who want to be pro coders often worry they’ve spent their time learning other skills and experiences that won’t help at all. Not true! Look at me: I don’t have any academic background — I was a set design major. I did professional scenic design during and after college. Being an up-and-coming scenic designer, you’re used to working with little or no budget, so you constantly have to make something out of nothing. Software engineering can be a lot like that. You have an idea and a blank screen. Now make it real! Also, as a set designer you must be super-responsible that what you do is not only good in itself, but fits in with the rest of the production. It’s the same for software engineering. If your APIs don’t connect to the right functions, or if you yourself aren’t really part of the team, your work will fail. If you’ve worked in the real world, you already know that you can love a job that’s incredibly hard, if you believe you can win at it. At Hackbright, I was exhausted for 12 weeks straight. But every time I was ready to give up, I found that after I went for a walk to cool off, I started thinking about how to approach a coding roadblock differently. I found myself heading right back to my keyboard to make it work. Hackbright also introduced me to mentors from the happening part of the local tech scene — different people with different jobs and backgrounds. In fact, my original alumna interviewer for Hackbright was a data engineer. I knew that I wanted to keep working with data, just not with spreadsheets. My interviewer explained how data engineering was different from back end, front end, or full stack engineering roles. This, I realized, was the thing I wanted to do after graduating. I just hadn’t known what it was called. Just as important, they opened up about their own career journeys, some of which involved way more hopscotch than mine. I learned from them that becoming a software engineer doesn’t mean you get a badge. All it means is you are constantly coding. The job title doesn’t make you good at it — you just have to keep coding until you are. My mentors let me see their own work wasn’t perfect — they made what they do seem accessible to me, rather than beyond my reach. When it was time to interview with companies, I was ready: Eventbrite, one of the Hackbright partner companies who came by to meet graduating engineers, was a company at which I’d interviewed for an analyst job, but had turned down their offer to go to bootcamp instead. I let them know how much I’d love to join their fabulous team — as a data engineer. While Hackbright’s classes and curriculum are undoubtedly excellent and launched me into this profession, the network of alumnae and mentors is what will continue to push me to advance my skills and career. As my cohort-mates showed me from our first day, the Hackbright community is made up of people committed to improving each other and our profession, not just learning for ourselves. My mentors opened doors for me by opening my eyes to what’s possible in the world of software engineering. I look forward to doing the same for other women, showing more aspiring programmers that there’s no magic moment when you “Become An Engineer” — if you want to code every day, and you’re willing to work hard, you already belong here.